In the last hacking tutorial we have installed the Metasploitable 3 virtual machine on Windows 10 using Virtualbox, Vagrant and Packer. After setting up the virtual machine with Windows Server 2008 the installation script installed and configured all vulnerable services and applications. One of the vulnerable applications is ManageEngine Desktop Central 9. This version of ManageEngine Desktop Central 9 contains several vulnerabilities that allow us to upload files and execute commands on the target system. Both vulnerabilities have been patched by the vendor back in 2015. 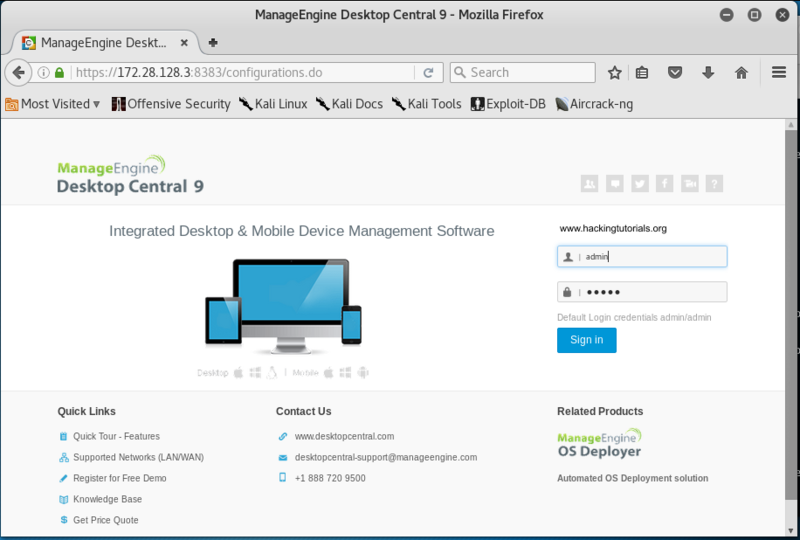 Before we start exploiting these vulnerabilities let’s have a look at what ManageEngine Desktop Central 9 is used for. ManageEngine Desktop Central is an integrated desktop and mobile device management application that helps system administrators in managing servers, clients devices and mobile devices from a central location. The software includes functionality for patch management, software deployment, remote control and many other features to manage IT assets and configuration. ManageEngine Desktop Central is managed through a web application that is running on port 8383 on Metasploitable 3. The scan results indicates that the Metasploitable 3 machines is running a lot of services, including an Apache HTTPD service on port 8020 and port 8383. Clicking the ‘Sign in’ button takes us to the Desktop Central 9 administrator page. From this point on it should be easy to turn this new access level in a shell on the target machine. This can usually be done by locating known vulnerabilities or by (mis)using the default functionality on this software. Especially on sensitive and feature rich applications like Desktop Central this should not be too hard. To turn regular functionality into a shell we should be looking out for functionality to upload files, install plugin’s, edit system files and anything else that allows us to execute code or commands on the target system. HTTP Port refers to the normal port that Desktop Central agents use to contact the Desktop Central server. The default port number is 8020. HTTPS Port refers to the secured port that Desktop Central agents use to contact the Desktop Central server. The default port number is 8383. Another important step to take at this point is to search for (sensitive) interesting information on this renewed access level. Interesting information is information that can help us further in the process of identifying vulnerabilities and in the exploitation process. Examples of interesting information are the version and build numbers, credentials, administrator notes, tickets, configuration parameters, system information and anything other information that tells us something interesting about the target. In the header of the administration panel we can find the version and build numbers: ManageEngine Desktop Central 9 Build 91084. This is great information that we can use to search for known vulnerabilities for this specific version and build of Desktop Central 9. Rapid7 ManageEngine Desktop Central FileUploadServlet ConnectionId vulnerability description. 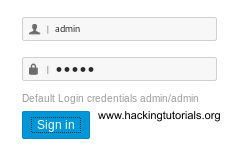 As we can see the version and build number exactly match the numbers on the administration panel. 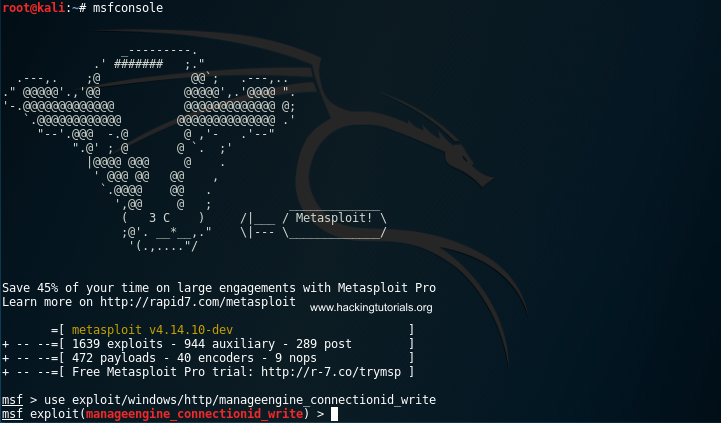 Let’s run this exploit from Metasploit in the following section. RPORT: The port that ManageEngine Desktop Central web interface is running on. TARGETURI: The base path for the ManageEngine Desktop Central web interface. Finally type ‘run’ or ‘exploit’ to execute the exploit. If everything went successful we now have a shell on the Metasploitable 3 host. 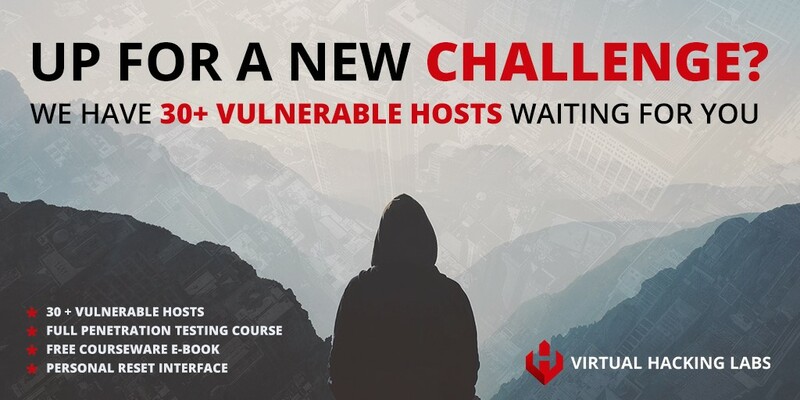 From this point we can work on privilege escalation and run post exploitation techniques. The Metasploitable 3 machines contains many more vulnerabilities that we will exploit in upcoming tutorials. Some of the even require to use pivoting techniques which we will demonstrate in the next Metasploitable 3 hacking tutorial. I don’t understand why port 8020 (the default value) is used because in nmap scan result (your first picture) i see two ports for apache http (8020 and 8383). Second why i don’t understand is that desktop central 9 is running on port 8383. 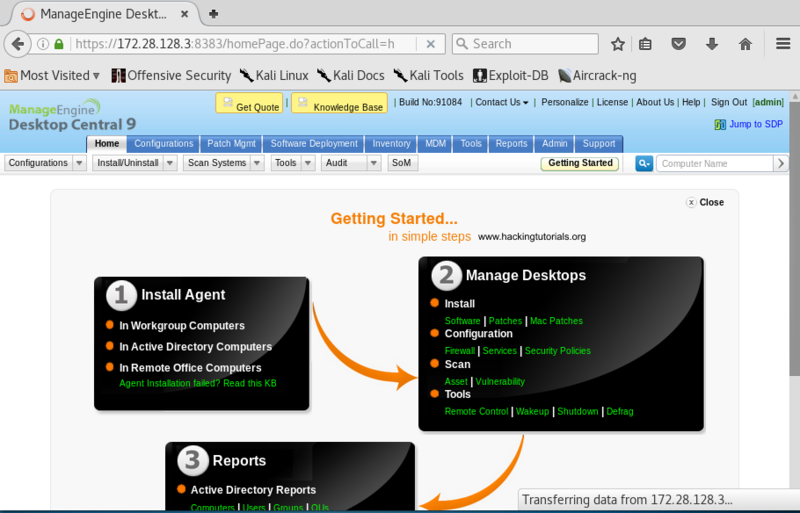 So why in metasploit port 8020 is used?